While Compaction & Baling can have great economical benefits choosing the right model is paramount to the overall success of your project. Leave the critical decisions to the experts. Contact National Equipment Solutions (NES) for a professional site survey today. 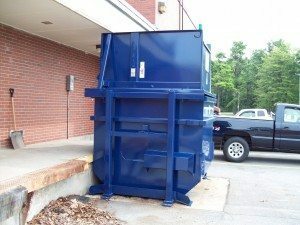 We will review your Waste Stream, Study your site, and propose an appropriate Compaction or Baling solution custom designed to suite your particular waste stream and site conditions. Our Equipment specialists have the experience to help you identify the right equipment for your waste stream and planned or existing building envelope. A compactor is a Structural Steel Machine utilizing Electric over Hydraulics to reduce the size and space required to transport materials to a disposal site. The machine generates pressure and crushes materials into a confined space creating “compaction” or size reduction. Available Sizes; 2 thru 6 cubic yard capacity machines which commonly have a 40 cubic yard Breakaway Collection Container Attached. Not everyone generating Solid Waste & Recyclables is an ideal candidate for Compaction. The Waste & Recycling Industries are volume driven. The greater the volume the greater the likelihood Compaction will make economic sense. While Volume is the leading indicator for Compaction Opportunity other factors may also influence a Compaction Solution. Generators of Less than 10 cubic yards peSir week are not likely candidates for a Compactor. Generators of over 40 cubic yards per week have a greater potential to benefit from Compaction. Is your firm interested in Exploring Safe Cost Effective Compaction alternatives to traditional trash collection systems? Contact us today for a complimentary evaluation at 610-640-9200 to find out more about selecting the right equipment for your facility.